That £650 price tag looks steep attached to an LG TV, but then the 32LH7000 does sit in the upper echelons of the manufacturer's current range. Other TVs in this range include the 37LH7000 and the 42LH7000. You get lots of TV for your buck, too. 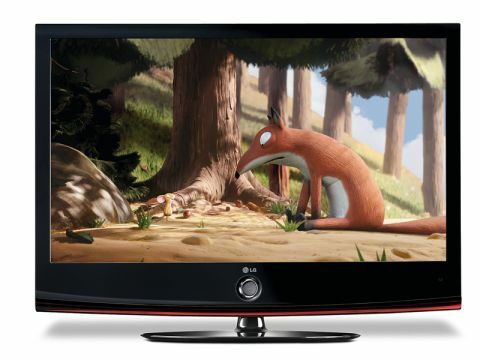 For while most sets these days like to stay slim and unassuming, the 32LH7000's glossy, tastefully curved bezel sticks out for many inches around the screen – especially at the bottom. This creates a dramatic sense of style, but we suspect some people might not like the way this 32in TV can dominate a room. Connections prove less divisive, with four HDMIs and an USB port capable of playing music, photo and video files. In fact, it can even play HD video in the DivX HD format. The 32LH7000 also supports Bluetooth, which means it can play files stored on mobile phones, or send audio out to compatible wireless headphones. The 32LH7000's onscreen menus, meanwhile, are terrific: bright, clear, and sensibly organised. This doesn't mean they haven't got a lot of features to cope with, either; the amount of picture tweaks at your disposal is prodigious, giving the independent Imaging Science Foundation (ISF) all the tools it needs to endorse the screen as one that their engineers could professionally calibrate. You probably won't need them, though, thanks to a handy Picture Wizard tool that guides you through various picture adjustments via a series of built-in test signals. We would recommend that you do use this feature, as the factory picture presets are dire. After a few minutes of calibration, the 32LH7000's pictures go from pretty bad to rather good. Colours are bright and breezy, especially with HD. High-definition images look decently sharp, too – not amazingly so, perhaps, but sufficiently so as to reveal the 'HD advantage' without looking forced. The clarity is bolstered by some respectably clean motion handling, courtesy, we suspect, of the TV's 100Hz processing engine. Even the 32LH7000's black level response – traditionally an LG weakness – isn't bad, with only relatively minor trouble from the dreaded 'grey mist' phenomenon. There are two significant problems with the 32LH7000's pictures too, though. First, while colours look good from HD sources, they occasionally suffer some strange tones while displaying standard definition. Second, while the 100Hz system certainly reduces LCD motion blur, it also creates a few undesirable side effects, such as occasionally glitched edges and the odd piece of stuttering. The 32LH7000's audio, meanwhile, is good on the raw volume and treble detail fronts, but falls short on bass, and can thus sound a bit hissy.